Select a healthy house or garden plant to take the cuttings from. This is referred to as the mother plant. Making plants from cuttings is a way to clone the original mother plant and a very inexpensive way to increase your stock of plants. Plants with non-woody stems are easiest to propagate. The mother plant should be large enough that removing one or more cutting will not harm or kill it. 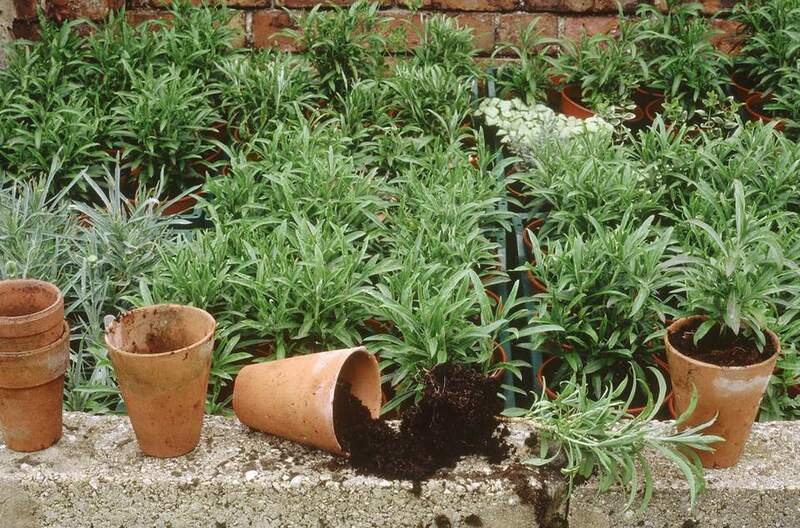 Fill a clean plant pot or container with the soilless potting mix, to hold the stem cuttings for rooting. A soilless mix drains better than garden soil and achieves a moist, but not wet quality. Additionally, garden soil contains spores and other pathogens that could kill the cutting before it ever takes root. You don't need a large container or a lot of potting mixes. Once the cuttings take root, you are going to re-pot them anyway. Choose green, non-woody stems for taking tip cuttings. Newer growth is easier to root than woody stems. You are looking for a stem with a node on it. A node is where a leaf is or was attached. It looks like a joint on the stem, and it is where the new roots will come from. Use a scissor or razor blade that has been sterilized in alcohol to make a clean cut, just below a node. The cutting doesn’t need to be long. A single node with a couple of leaves will be fine. Longer cuttings will dry out faster. Place the cutting on a flat, hard surface and make a clean slice through the middle of the node with a sterilized razor blade. Plant stems send our their new roots from the stem nodes. Making the cutting at the node increases your chance of successfully rooting the cutting. Remove all but 1 or 2 leaves. The cutting needs some leaf growth to continue photosynthesis since it can’t take in any food from roots it doesn’t yet have. But too many leaves will sap energy from its efforts to create new roots. If the leaves are very large in proportion to the stem, cut the leaves in half. A rooting hormone stimulates the plant cutting to begin sending new roots out of a stem node. The hormone is not always necessary for the cutting to root, but it does give it an advantage and increases the success rate of creating new plants. Many plants will even root in plain water, but transferring the water rooted seedling to the soil is not always successful. Fill a cup or container with water and place some rooting hormone into another container. Dip the node end of the plant cutting into the water and then into the rooting hormone. You won’t need many hormones. Too much rooting hormone can lower your success rate, so tap off the excess. Don’t return used hormone to the original container. Once it comes in contact with the cuttings, it is activated. Carefully place the cuttings into the holes you made in your potting mix and gently firm the soil around them. You can fit several cuttings into one container, but space them so that the leaves do not touch one another. Place the container of cuttings into a plastic bag. The bag will keep the humidity high and hold in heat. Don’t seal the bag completely, to allow some air flow. Place the bag and container in a warm spot in the house. Don’t put them into the full sun until new growth appears. At that point, you can take them out of the bag. Check regularly to be sure there is not so much condensation on the top of the bag that it is dripping onto the seedlings. If this happens, the potting mix is probably too wet. Allow the potting mix to dry out a bit and then replace the bag. Check your cuttings regularly in case they start to rot before they root. Remove any suspect cuttings as soon as you spot trouble. Keep the cuttings moist and in a few weeks check for roots by tugging gently on the cuttings and testing for resistance. Once the cuttings have developed roots, they are ready to be removed from the bag and planted into pots of their own. What Are the 19 Easiest Plants to Grow From Cuttings?